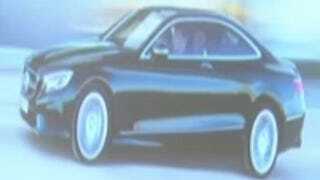 Daimler may have given its investors a sneak preview of a new coupe due out this year. By power of deduction, it's likely this is the 2015 Mercedes-Benz S-Class Coupe. In a change for Mercedes, this coupe appears to have only two doors. According to the German site Mercedes-Fans and other sources, this rather squishy image was called the S-Class coupe in the meeting, and it's coming to next month's Geneva Motor Show. It does share a general swoopiness with the Mercedes S-Class Coupe Concept shown last year at Frankfurt. The S-Class name replaces the CL line in Mercedes new attempt at coupe nameplates. What do we know about the S-Coupe? Like the 2014 S-Class, it's bound to be an incredibly luxurious way of doing important business on the move – only in a much more intimate setting. Expect V8 and V12s as well as all-wheel drive, but not a diesel or hybrid, at least in the U.S. It'll be interesting if Mercedes is brave enough to do some downsizing on one of its most exclusive cars. But with all of the available crash-avoiding tech on the new S-Class, this could also end up being one of the safest ways to spend more than $100,000. See? Logic.